HAMPTON TOWNSHIP, MI— Hampton Township Supervisor Tom Foret is overjoyed. He learned Thursday a $13 million assisted living development is being built in his township, beating out three other Bay County municipalities. 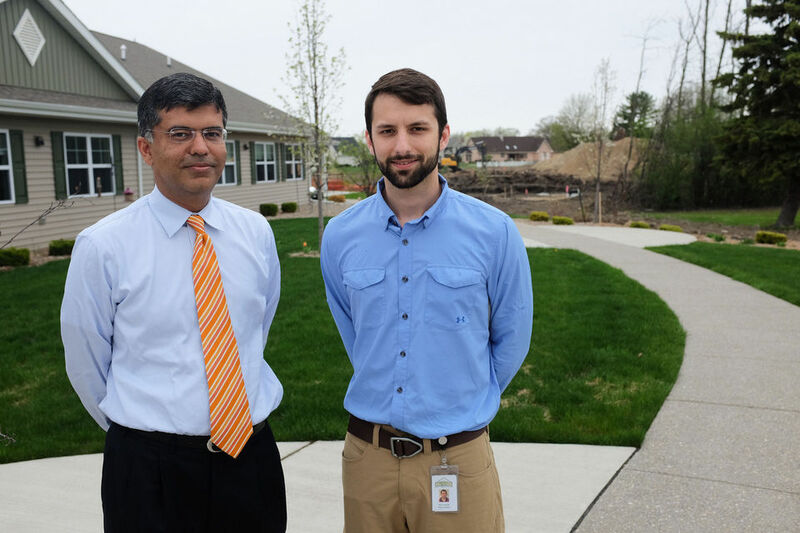 K. Rumi Shahzad, founder and operator of New Hope Valley, an assisted living, memory care and soon-to-be independent living facility that operates in Saginaw Township, is expanding into Bay County and on Wednesday, May 27, closed on a 14-acre parcel on Pine Road. The land is home to the Fairway Golf Center driving range, across the street from a Meijer store. Shahzad paid $220,000 in cash for the property. The facility is to be called New Hope Bay. And they’re going to start quickly. Shahzad anticipates breaking ground Aug. 1 and opening a 70,000-square-foot, 70-apartment assisted living and memory care facility on the east side of the property by May 1, 2016. Construction on a separate, 90,000-square-foot independent living facility would start in 2016 with an opening in 2017. Marlette-based Korte Construction is to be the general contractor for the project, Shahzad said. Crews from that company are currently building an 80,000-square-foot addition to the existing 42,000-square-foot New Hope Valley facility in Saginaw Township. Shahzad, who runs the assisted living operation with a team of 19 doctors who practice in Bay, Midland and Saginaw counties, said the business chose Hampton Township due to the size of the available land parcel. Bay City, Bangor Township and Monitor Township were also in the running for the project. As he was shopping locations, it was unclear what kind of incentives he was trying to land for his project. He wants the development to be pedestrian friendly and is asking Hampton Township officials to connect the sidewalk that currently ends north of Meijer. The township was also able to take advantage of the state’s commerical rehabilitation program that’s going to give the developer about a 50 percent tax break for the next 10 years, according to Foret. The development is actually going to be located in the Hampton Township DDA, so the township won’t see a boost in revenue. In 2014, the Hampton Township DDA captured $147,971, about $36,000 of which didn’t go back to the township, according to Bay County financial records. Fairway Golf Center, which has operated at the property since 1997, is staying open through July before closing for good. Shahzad worked a deal with the Laroche family, which owns the driving range, to donate revenues from those two months to three charities. He anticipates raising about $7,500 and said New Hope Valley would match that amount for a total of $15,000, to be split evenly between the three charities. He let Foret at Hampton Township pick one of the charities; he chose to donate it to the Save Brian’s House community group which is reopening the former hospice facility in Hampton Township this fall. Funds also are being donated to the Alzheimer’s Association and St. Mary’s of Michigan Field Neurosciences Institute in Saginaw Township. Shahzad said the company is accepting resumes for certified nursing assistants and other positions. Those interested can apply at the company’s Saginaw Township location, 3785 N. Center Road. Minimum wage employees at New Hope Valley’s Saginaw Township location make at least $10 per hour, Shahzad said. “We want people who are compassionate and have a passion for serving our seniors,” he said. Foret hopes the development drives future growth in his township.